This post contains some closing comments to the two previous posts in this series. : part 1 and part 2. What is added here is three dimesionality, the previous two parts of the discussion having focused on the horizontal distributions of mid atmospheric conditions. The maps presented in those foregoing discussions represented horizontal slices out of three dimensional analyses of the atmosphere. Note that the analyses were based entirely on data provided by soundings of the atmosphere taken by rawindsondes, which are simultaneously launched worldwide twice a day at 0000 and 1200 GMT (Universal Coordinated Time, UTC in the most recent terminology). In the following, the weather situation is analysed for the day before the central United States was in the grip of the Arctic airmass. Fig. 1 Depiction of the height field of the 500 mb pressure surface in tens of meter for 1200 Greenwich mean time, 15 January 2018. The morning of 15 January 2918 a new frontal surge was developing on the western side of a large, upper atmospheric low pressure area centered just west of the Great Lakes (Fig. 1) . Over the East Coast, remnants of the previous storm were ejecting to the north-east. Note the black line vertically oriented through the center of the figure, which runs very closely South through North on the polar stereographic projection map of the U S along the 97th meridian. Fig. 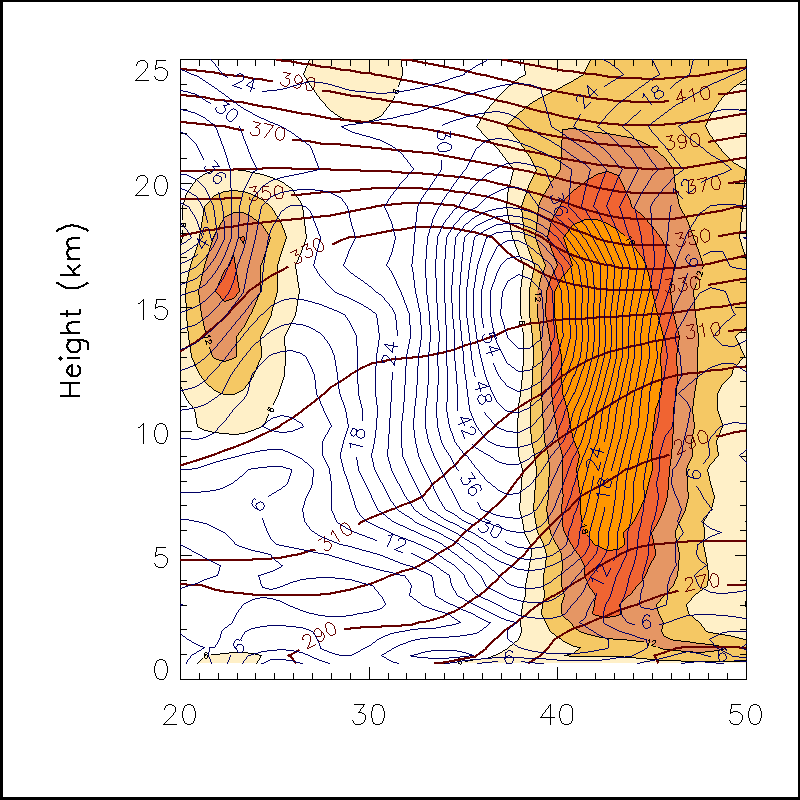 2 A vertical cross section depicting the atmospheric structure along the black line depicted running vertically through the center of Fig.1. The horizontal scale is in degrees of north latitude. Color-shaded areas represent the QG potential vorticity field. The sloping horizontal line represent the potential temperature in degrees Kelvin, and the closed black contours are the isotachs of the wind in meters per second. The vertical cross section of atmospheric variables (Fig. 2) forms a familiar pattern known to researchers in the field of jet stream dynamics. In this case, there is a well defined polar jet-stream core located at at about 37 degrees north latitude along the 97th meridian at a height of about 15 km above sea level. In the cross section cited above (Fig. 2), the polar front appears as the zone where the lines of equal potential temperature (isentropes rather than isotherms) point downward through the atmosphere. Isentropes are related to isotherms through the pressure in a way that the vertical gradient of on becomes of opposite sign to that of the isotherms. Contrast the isentropes in Fig. 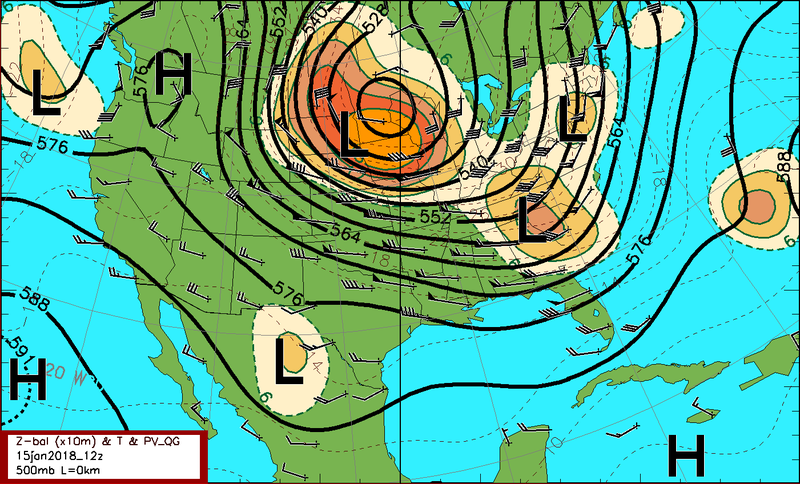 2 with the isothems in the cartoon figure linked by the above jet stream reference. A bit of explanation is required here. Thermodynamically, both reversible and irreversible processes occur in the atmosphere. A reversible process involving changes in temperature is called adiabatic. No change in entropy happens in an adiabatic process, so that it can just as well be called an isentropic process. Vertical atmospheric motions that result in billowing cumulus clouds are explained as resulting from temperature effects of parcels of air. The simple explanation given is that air warming than the surrounding atmosphere, rises, and colder air, sinks. A small child wonders however, about a recent airplane trip. At cruising altitude, the child was told that the air outside was very cold, cold enough that if it got into the passenger compartment, it would freeze everything there in a few minutes. But wait, when they landed and got out out of the plane, it was warm shirtsleeve weather. Then the child's question came, "Daddy, if it is so cold up there and so warm down here, why doesn't the cold air from up there just fall and freeze everything down here?" To answer the child's question requires more than simple talk about cold air sinking and warm air rising. It requires some understanding of physics, specifically thermodynamics. One begins by pointing out that atmospheric pressure decreases with height and tapers off into nothingness above 100 km. The decrease of pressure with height implies that unmixed parcels of air moving vertically will undergo temperature temperature changes as a result of pressure changes, which are reversible. In this case, the child's father was a physicist and he refreshes the child's memory of all the little experiences that he and the child went through involving mundane tasks such as pumping up tires and letting air out of a balloon. So he got the child to understand that if he pulled some of the cold air from up there down to the ground, it would be much hotter than the air down there. Being hotter than the air at the surface, the parcel of near stratospheric air would shoot back up and find its equilibrium temperature where it would be the same density as its environment. The effects on temperature produced by adiabatic atmospheric processes are simplified by defining a potential temperature for a parcel of air at any height, by the temperature that it would have if brough adiabatically to some reference level. Meteorologists use the 1000 (mb or hectopascal, hPa) as that reference level. By its very definition, the potential temperature does not change under any adiabatic process. As a result, lines of equal potential temperature are referred to as isentropes. Note that in terms of isentropes, the stability of the structure of the atmosphere is made explicit: potentially colder air underlies potentially warmer air. Speaking in terms of potential temperature, potentially colder air sinks and potentially warmer air rises. At this point, the concept of potential vorticity should be explained; however, by now the reader is probably tired of explanations, so a detailed explanation is deferred to a later discussion. Here, it is simply mentioned that potential vorticity combines the effect of vorticity and vertical density stratification in such a way that it incorporates the effects of angular momentum conservation. Through objective analysis of observations at various points in the atmosphere, one can generate analysis of various meteorological fields over three dimensions at every time that data are available. Through further computations, one is able to compute other fields of interest which may not be directly measured, or even below the resolution of direct measurements. Further, algorithms developed for objectively analysed data can be used on similar data generated as output by numerical weather prognostic (NWP) models.